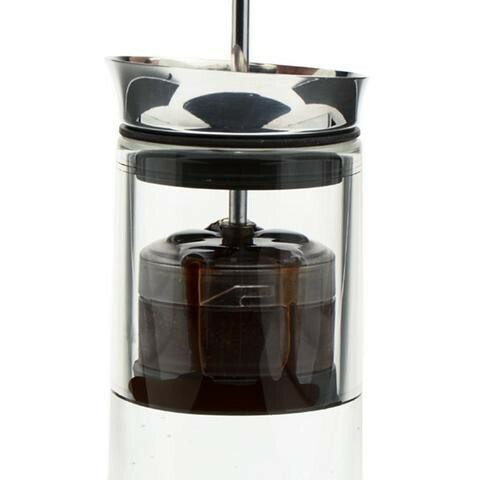 A unique joining of two renowned brewing techniques, the American Press combines a pressurized brewing technique (similar to the Aeropress) and the classic shape of a regular French press into an all-in-one, travel-ready coffee companion. Designed with sleek sipping in mind, the American Press features a micro-mesh filtered brew chamber that you press through your brew water. The result? 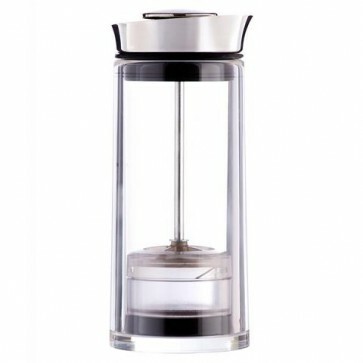 A visually striking reverse pillar of coffee ready to drink in under 3 minutes. Contained Grounds - A twist-in filter canister keeps your cup clean of sediment and offers an easy cleanup solution. Double-wall Tritan Plastic - Shatter-proof and BPA-free, the Tritan build of the American Press also serves to keep your coffee hot for ages. 100-micron Stainless Steel Filter Screens - Two reusable stainless steel filters keep grounds in but let oils out of the brew chamber. Simple Spout - A gentle curving lip makes the American Press easy to drink or pour from. Single Cup Solution - Just the right size for a piping hot cup of fresh coffee. Neat! - Fit and finish on the American Press is impressive, and the way the coffee seems to condense under your touch never gets boring. Easy Cleaning - A quick unclipping of the brew basket and a rinse has you reset for a second cup at a moment's notice. Pressure Brew - You're physically pushing your ground coffee through a sealed brew water chamber, creating a rich brew that's hard to beat. Insulated Tritan - The insulated body of the American Press keeps coffee hot and hands cool. One Cup Only - The American Press is limited to single (12 ounce) cups of coffee. No Reheating - The Tritan carafe has a bitty ring of metal at the lip, meaning it's definitely not microwave-safe. Pressure - It takes a decent amount of pressure to use the American Press, which means it might not be a great pick for someone with arthritis. Like an Aeropress and travel mug in one! We found small variations in your brewing technique—pre-infusion, dose adjustments, pressure—made little, if any, difference in the final brew flavor. This makes the American Press a forgiving brew method, but also means it's less versatile than the recipe-rich Aeropress. We recommend starting with American Press' ideal dosing: 22g (0.75 ounces) of coffee to 355ml (12 fluid ounces), and to aim for a medium, pour over grind. Do not use rough brushes or sponges to preserve long-term clarity of Tritan walls. Disassemble and clean filter basket after every use.